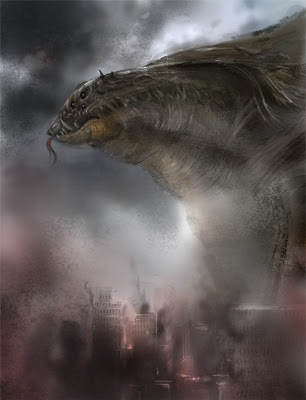 Art Tutorial Gamera Giant Monster concept drawing and painting video is inspire by Sin from FF and the old monster movie "Gamera." I saw Cloverfield the trailer before the movie and I got pretty excited and wondering what is the beast looks like so I just start doodle it and make a video. I can’t wait until the movie comes out. Awesome Music by Spinny (Pow Pow) free promo demo. *It could also be done with pencil and paper. -Drawing arm, shoulder, and torso. Feel free to comment and if you have any question about how to draw and such. Do not hesitate to post any question, I will try my best to answer any question about art as much as possible. ALSO if you want to see the BLOG update more often and not DISAPPEAR from the INTERNET, PLEASE help US DIGG, STUMBLE, TECHNORATI, send them to friend!!!!! You use alot of different brushes, like for the buildings, smoke, texture, etc. are most of these homemade, or are many of them standart brushes that can be found in the photoshop toolkits of any decent concept artist? Might there possibly a site or someplace you'd suggest to look for good concept art brushes? wow,is it just me or does it look alot like Sin from FFX? Johannes>> Look on the right handside of the blog...there are Photoshop brush tutorial. Most concept artist make their own brushes. you added me on twitter, and i fell in love with your blog. my art blog bearded bunny blog (http://www.beardedbunnyblog.blogspot.com) would be glad to trade links if you do such a thing. williamhessian> Thank man, i will stop by. As for the link trade, my page is max out...I am considering take some of them out because our Google page rank is going down because we have too many link. Though you can go to our community post you art and link on the post that would be cool and it doesn't effect to page rank. Peace!